Farming Smarter will be hosting its first annual Cypress conference at the Medicine Hat Lodge on Oct. 26. Starting at 8 a.m., the full day conference will showcase cutting edge information on various facets of the agriculture industry in southern Alberta and beyond. The format change to a one day, annual conference in Medicine Hat instead of a two day biannual conference should maximize Farming Smarter’s efforts to reach out to local farmers in a way which is informative and relevant to their concerns, says Farming Smarter assistant manager Jamie Puchinger. This year’s keynote speaker at the Medicine Hat conference is Dr. Mary Burrows, who will speak about wheat streak mosaic virus. But Puchinger expects the session on land tax and income sharing, hosted by Ryan Stevenson of KPMG, to produce the hottest debate at the conference this year in light of recently proposed federal income tax changes. Other topics covered at the conference will be “Zebra Mussel Tussle,” “Forage Foundations,” “Resistance is Futile,” and several other informative sessions ranging from insect control to watershed health. Puchinger says the Farming Smarter conference has been growing in attendance and popularity each year. And more farmers seem to be keenly interested these days in finding new ways to inform themselves and increase their farming education to enhance the efficiency of their operations, she says. Farming Smarter is happy to be able to double its conference offerings to have sessions both in Medicine Hat and Lethbridge every year, says Puchinger. 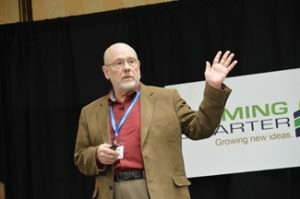 For more information on the upcoming conferences in both Medicine Hat and Lethbridge visit the Farming Smarter website at www.farmingsmarter.com. Plant scientist Jack Schultz speaks at the Medicine Hat Farming Smarter conference in 2016.